From Bilal Baydoun’s home on the east end of Dearborn, it’s a 15-minute walk to Detroit. But the neighborhood, he says, is something of an anomaly. “It’s overwhelmingly Arab and Muslim—probably 90 percent,” he says. To illustrate, Baydoun describes stepping outside during Ramadan to find scores of neighbors gathering on porches at 4 a.m., waiting to come in for their last meal before sunrise. Baydoun’s family came to the United States from Lebanon. They’d lived through war and military occupation, then fled during the nation’s civil war. 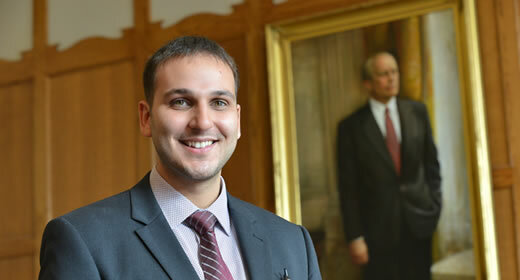 As a U.S. citizen of Arab and Muslim heritage, coming of age in post-9/11 America forced Baydoun to think a good deal about his identity in the American context and about politics overall, which is one reason why he was drawn to study policy. As an undergraduate at U-M, Baydoun studied history, and says he is still surprised he was able to get away with it. “Those were lectures I would have gone to in my free time,” he says. “I loved it so much.” But he remembers, too, the culture shock as a first-generation college student from an immigrant community and a working-class family. “[The University is] just 45 minutes down the road from my home, but it’s worlds away,” he says. Baydoun can’t remember having a single white friend growing up, and notes that most of his U-M classmates came from well-off families, were able to take unpaid internships, could travel for enrichment, and more. After graduation, Baydoun found work as a business analyst for a small consulting firm in Detroit, collaborating with other analysts and developers to produce effective software solutions for healthcare clients. Below is a formatted version of this article from State & Hill, the magazine of the Ford School. View the entire Fall 2015 State & Hill here.